It is said that over 500,000 people lost their lives in the colosseums of Rome with very few of the competitors advancing to Gladiator status. Scratch the cards away and uncover your destiny in this barbaric online scratch card game. NextGen has been delivering innovative and creative online slots for almost two decades. The energetic development team knows how to provide extraordinary entertainment and quality video slots. NextGen Gaming is one of the leading developers in this market and has proven themselves very popular. They also offer a big collection of games with a variety of different themes, pleasing a wide audience. If you enjoyed the video slot of Call of the Colosseum but you are looking for some variance to from the online slot game then this is the perfect choice! Scratch Call of the Colosseum is all about the ancient Roman Empire and the legendary fights that used to take place in the impressive structure of the Colosseum. You can see the battle arena in the background bringing you right back to the time of the roman emperors and epic fights that used to be held there. The art style is nothing extraordinary but it fits the theme fine. The scratch card is on the left of the screen and to its right side is the paytable which gives you information on the different payouts possible in the game. On the right side of the screen are all the game controls and a button that will take you to the slot game version. To win you will have to uncover at least three matching symbols. You will find iconic symbols of the Roman Empire hidden underneath the 3x3 scratch card: the emperor himself, nice brown leather sandals, a warrior's shield and helmet, a chariot, a dangerous looking tiger and a sultry female. The Colosseum and the games logo is what covers the scratch card and you can decide to scratch of every position yourself or reveal all of them at once. If you match three of the scarred shields you will activate the bonus feature. The Ladder bonus will make you collect as many coins as you can in order to go up to the ladder. The prize depends on the number of coins collected in the duration of this bonus feature. A scratch card can be bought with a minimum of 1p or up to 5 pounds. Just place your bet and press the play button to give it a go yourself. Scratch Call of the Colosseum is a great variation from the original video slot. It features the same art-style and symbols but brings along a new exciting bonus game. The rules are very simple and the layout is very easy to overview while playing. If you manage to match three of the same symbols you may turn your game very profitable for you as there are some pretty high-paying symbols. 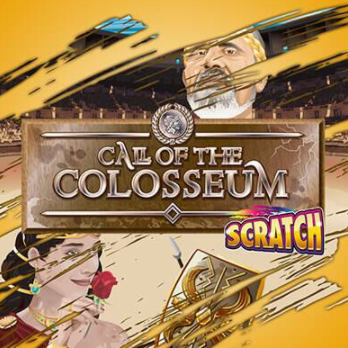 Scratch Call of the Colosseum will provide you a great and relaxing gameplay experience with a nice ancient Rome theme.